Today, milk chocolate contains chocolate liquor, cocoa butter, vanilla, milk solids, and lecithin. Milk chocolate must contain 10% chocolate liquor, 3.7% milk fats, and 12% milk solids. The quality of milk chocolate varies from brand to brand with European brands usually of higher quality. The following history information on Daniel Peter (1836-1919), the inventory of milk chocolate was written by Francois Auguste Peter, Sr. (1898-1991), grandson of Daniel Peter. This history was shared with me by Marcia Chalupnicki, granddaughter of Francois A. Peter. The following information is unedited. Daniel Peter was born in the village of Moudon, located in the Canton of Vaud, in beautiful, mountainous Switzerland in 1836. Peter attended school and graduated there. At the age of 19, his professor of Latin became sick and the local Board of Education asked Daniel to instruct the Latin class. As one can imagine, this was a difficult task for him as he had to teach students who were only one or two years his junior; nevertheless, he gave a good account of himself and his record is good on this score. During the summer of 1852, Peter worked in the local food store of the widow, Madame Clement, who also owned a candle-making factory for the locality. The conscientious, dedicated working qualities of Daniel Peter were first evidenced here and he gained the esteem of Madame Clement. Four years later, Daniel and his brother, Julien, operated the candle-making factory while Madame Clement retained its control. The two brothers developed and improved the candles, which at that time in history were the only light source, and they sold well locally. In fact, the demand was such that the factory required a larger working space, and the brothers purchased a building at 19 Rue des Bosquets, in Vevey, Switzerland. The purchase of this building was made from the estate of Francois Louis Cailler. It was through Madame Clement that the young Daniel Peter was introduced to the Cailler family and through them, he met Fanny Cailler, the eldest daughter of the family, whom he married on October 1, 1863. In the United States, a Colonel Drake of Pennsylvania had discovered oil in that state in 1859 and subsequently, kerosene was introduced in Switzerland about 1864 or 1865 which greatly affected the candle-making business of Daniel and Julien Peter. Daniel realized that the earnings from the candle-making business would not suffice for both brothers n ow, so he proposed to his brother-in-law, August Cailler, an association for the manufacture of chocolate, however, this did not take place. It appeared to Daniel that the chocolate business had received such a favorable public reaction that it would soon overcome the Caillers’ capacity to produce the product. It was for this reason that Daniel decided to go into business on his own. Peter was a very determined young man and he realized that in going on his own in this business, he would be a competitor to his wife’s family, however, his lovely Fanny gave him her full confidence and support. Julien Peter remained in the candle-making business and used only a part of the building originally established for this purpose. Daniel Peter installed his chocolate business in the remainder of the space. It is interesting to note that sometime during this period, Daniel Peter, in order to know as much about the chocolate business as he could, worked as an employee of a chocolate factory in Lyon, France, for a few weeks. He spent his time in the evenings and on Sundays documenting the technical questions raised in the manufacture of chocolate in order to know the mechanics and chemistry of the business. He also studied the cocoa harvest and transportation of the basic cocoa ingredients from the tropics. Within a few years, Daniel Peter had formed a strong friendship with his neighbor, Henry Nestle, who had settled in Vevey, Switzerland, about 1843. Nestle had developed a process to make baby food in which he used what was then called a “milky flour.” It was at this point in his life that Daniel Peter asked himself the question, “Why not try to make a chocolate containing milk?” This idea stayed with the young Daniel Peter to the point of becoming an obsession with him. He further realized that in order to stay in the chocolate market, already principally controlled by Caliller, Suchard, Kohler, and others, he must produce a new product that would become pleasing and desired by the consumer. In 1869, Julien Peter died, leaving Daniel in charge of both businesses and still carrying on the major problems of research associated with the manufacture of milk chocolate. Daniel Peter, therefore, gave up the candle-making business at this point and devoted every waking hour to the manufacture of milk chocolate. At this time, Peter’s personnel consisted of one employee and his wife. He manufactured his chocolate products in the daytime and did his office work and research in the evenings and often late into the night. He obtained a stable product, composed of cocoa, sugar and milk that was unlike the milk-flour in baby food used by Nestle. Wheat flour, as used by Nestle, has little if any fatty body, while cocoa contains, depending upon its source and the degree of maturity of the harvested bean, from 45% to 55% of fatty matter. As was well know to most persons interested in the product at the time, water ad fat do not mix. Not only is the mixture unstable, but the fatty product is simply not suitable to work with. Therefore, it remained that a certain percentage of the fat had to be extracted from the cocoa bean. This process was known and was relatively simple. It was also important to dehydrate, at least partially, as much as possible of the water content – 87% to 89% from the milk. The equipment for this operation was complex and complicated. It required various tools and machines which were relatively costly and quite difficult to obtain in those days. In fact, such an installation represents in itself an industry which should be and would become integrated into the making of milk chocolate. Unfortunately, Daniel Peter was not in a position to acquire this equipment. In persistently seeking the process for a more economical manufacture of the baby food, Daniel Peter started his laboratory work by evaporating the milk itself in the free air, which was a time consuming process and required constant surveillance and attention. By mixing first sugar with the milk, the evaporation was aided, but it was hard to determine the te proportions of each product. As it was simply not enough to merely taste a finished product, weeks led to months in the checking of each individual test. Peter conducted many tests, all of which were quite expensive and none of which produced the desired results. At this time, the American brothers, known as the Page brothers, had come to Cham, Switzerland, but they were not yet in competition with Henry Nestle since they only made condensed milk while Nestle was producing the “milky flour” for the baby food process. T here was in fact, actually no competition with Peter’s friend, Nestle. The results of the tests, however, conducted by Daniel Peter toward the manufacture of milk chocolate did improve. Peter asked that his agents put his product for sale in cooler and dryer parts of the territory served by the factory. It is interesting to not that Daniel Peter sold a small quantity which he personally guaranteed to take back for refund should the merchandise prove unsatisfactory. It can here be seen that Daniel was optimistic, but unfortunately too much so. The immediate produce was favorably received, but after a few weeks, Peter received the unsold merchandise back. It had become rancid and he received some unflattering commentaries from his outlets because of this. He recognized that the criticism was justified. It turned out that the milk from Guin was not sufficiently condensed and therefore Peter hesitated to order more until he had achieved his goal for milk chocolate. He needed to avail himself of a proper vacuum with other supporting equipment which he could not afford at that time. Peter then equipped a small room which he called a “drying room” in which the product he made was transformed into flakes, spread out on trays, and exposed to a high temperature for further evaporation. This material was weighted before and after its exposure in order to determine the amount of evaporation. For Peter, the results were favorable. He was convinced that he was near his goal. He wished to confirm for himself these last results by getting all the moisture that he could out of the drying process. Finally, in 1875, Daniel Peter obtained his impossible victory. Through his hard work, he could not offer to his friendly dealers fro the Lac Leman region of Switzerland a milk chocolate of which the normal length of shelf life was assured. Very quickly throughout this region of Western Europe, the Daniel Peter milk chocolate found favorable acceptance, and the demand far exceeded the supply, making it necessary for Daniel to increase his production. The big decision for Peter had now to be made. He obtained sufficient credit from Swiss bankers to install a small copper vacuum and the equipment for manufacture with a capacity of from 60 to 80 liter. Difficulties and worries were never spared Peter during those long, tiring years, and although he declared himself pleased with the results of all testing, he still wanted to improve upon the taste of his milk chocolate. It should be noted by all that since the early 20th century, the countries of Europe have been producing milk chocolate of varying qualities. It should also be understood that the development of the process by Daniel Peter was created in the community of Vevey, with the Canton of Vaud, in Switzerland, and further pointed out that the first chocolate process, although not milk chocolate, was also created in Vevey, Switzerland, by Francois Louis Cailler, at the age of twenty-three, upon his return to that community from France and Italy in 1819. In 1901, the Peter milk chocolate was introduced in the British Isles. That same year, the city of Vevey, Switzerland, was unable to supply sufficient milk nor a large enough labor force to meet the expansion of the Peter plant. Therefore, a second milk chocolate plant was built in Orbe, Switzerland, which is also located in the Canton of Vaud. In 1904, Daniel Peter merged his successful operation with Amedee Kohler Chocolate Company located in Echandens, about three miles from Lausonne and fifteen miles from Vevey, and traded under the firm’s name of Societe Generale Suisse de Chocolat. Peter and Kohler sent a specialty team of four trained men with their families to be the general overseers of the company and to head various sections in the Fulton plant. Mr. G. Dentan was in charge of the treatment of the cocoa; Mr. Louis Michaud was in charge of the processing of the milk; Mr. Ernest Brechon was charged with the mixing and refining process for the manufacturer. Mr. Louis Ducret was responsible for conching and moulding. Mrs. Dentan was in charge of the wrapping and a Mrs. Gustave Ansermrt was the director of the entire process. In 1904, an agreement as reached establishing that the Societe Generale Suisse de Chocolat would manufacture a new chocolate with less cocoa and more sugar, thereby creating a sweeter milk chocolate which would be produced by that firm under the name of Nestle, and that all of the chocolate products would be sold worldwide by the Nestle selling organization. In 1911, the descendants of the F. L. Cailler Company joined to form the now famous company name of Peter, Cailler, and Kohler, Swiss Chocolate Company. Finally, in 1929, this company and Nestle merged in what was then known as the Nestle Anglo-Swiss Corporation. Daniel Peter, the inventor of milk chocolate for the entire world, died on November 4, 1919. At his funeral in Switzerland, he was highly eulogized for his work and his kind generosity towards the organization of cultural groups which are still active and befit all of the people of that country, and the region of Vevey, especially. The following history information is from the Journal Francais d’Amerique, Vol. 8, No. 21, 24 October – 6 November 1986, by Laurent Bijard of the French Press Agency. This article was translated by Francois Auguste Peter, Sr. (1898-1991), grandson of Daniel Peter, for his relatives. This history was shared with me by Marcia Chalupnicki, granddaughter of Francois A. Peter. The following information is unedited. Instead of the Swiss chocolate, Vevey is presently celebrating the 150th anniversary of the birth of Daniel Peter, the one who revolutionized the art of the chocolate tablet by inventing milk chocolate. In changing the color of chocolate on a beautiful day in 1875, Daniel Peter offered a miraculous second breath to an industry, still in it’s early growth, on the shore of Lac Leman. In fact, the enterprising families who produced the “Little Squares of Tenderness” were considered at that time as exceptions to export. Daniel Peter’s invention of the milk chocolate was about to modify this viewpoint by opening a new perspective in the Swiss as well as world Swiss chocolate industry. Today the great multinational Swiss Nestle, which has it’s headquarters in Vevey, does not hesitate to remind that the milk chocolate represents the essential of the chocolate industry across the world. Daniel Peter first saw light in 1836, in Moudon, in the state of Vaud, not far from Vevey. Like many other protestant families, the ancestors of Daniel Peter had left France after the revocation of the Edict of Nantes, so installed themselves in Switzerland by the end of the 17th century. Son of a meat market owner, Daniel Peter became apprenticed in business; nothing predestined that he would be the one to bring a massive improvement to the chocolate industry. At the age of twenty, he acquired, with his brother, Julian, a small candle factory. Cailler had opened h is chocolate factory at Vevey, a resort of the Swiss Riviera in 1819. In 1863, Daniel Peter married Fanny Cailler. The bride’s father had died in 1853, leaving behind him an enterprise that had among his clients a certain Talleyrand. Still the future of the black tablets began to experience certain limits, and as such, only a small part of its production was destined to the foreign companies. Little by little, the sale of chocolate left less and less profits. As one thinks of the history of this milky invention, one must think while realizing that the creation of the milk chocolate owes a lot to another creation, which curiously is the kerosene lamp. The adventure of the real pioneer, Daniel Peter, is equally close to another event, which is a mark in his life. His marriage with the daughter of the frist Swiss chocolate manufacturer, Francois Louis Cailler. Thanks to his marriage, Daniel Peter oriented his interest toward chocolate, especially since his candle factory is about to be closed by the expansion of the new kerosene lamps. Daniel Peter does not let this affect him as such. He, therefore, decided to go into the chocolate industry, having observed that industry. The industrial products intended for nutrition are among those that offer the most certain prospects. They spoiled every day and needed to be constantly renewed without becoming subject to the complaints of the people. And when you see the rapidity with which the babies devour a tablet of chocolate, it is not surprising that Daniel Peter searched for a way to impose himself on the chocolate market. He submitted himself to the ferocious competition between Cailler, Kohler, Suchard, and Lindt. He is conscious that he will not realize his dream without creating something new. In this period, we are in 1867. His friend, Henry Nestle, concocted his milky flour for babies, a product the basis of which is flour and milk. It is this inspiration that Daniel Peter conceived the idea to incorporate the fine Swiss milk with his chocolate. Chocolate is not yet a delicacy. It is more of a nourishing food, which profit those who must expert physical effort. To start his enterprise, Daniel Peter had only one employee, his wife, who wrapped the tablets. The couple continued for eight years before he was able to present his new creation. Daytime, Daniel Peter manufactured simple chocolate to subsist. At night, he search constantly for the formula which would allow him to amalgamate cocoa powder and milk. Because to incorporate milk and cocoa is not a simple affair, he must at all cost avoid the souring of the milk, which may produce a repulsive taste or noxious nasal odor in the tablet within two weeks. Along in his research, he entered into a relationship with the society Anglo-Swiss, a factory of condensed milk, owned by an American. Mr. Page, who installed themselves in Switzerland in order to insure Anglo-Swiss supply of the indispensable milk. In 1875, the lengthy research gave birth to “Gala Peter” from the Greek “gala,” which signifies “milk.” Little by little “Gala Peter” made its appearance on the shelves of food markets. Its copper-trimmed wrapper presents “The first of the milk chocolate” as “the healthiest of all chocolates, very nourishing, very digestible, a little sugar not causing thirst.” A little map of Europe inserted near the name “Gala Peter” description with the quote “As high as the Alps in Quality” already gives an ideal of Daniel Peter’s development of the European appetite. Highly approved, the manufacture of the milk chocolate was crowned with laurels at the universal Exposition of Paris in 1878, where Daniel Peter received the silver medal. Daniel Peter goes to England, but did not neglect the markets of Germany, Italy, and Austria. Beside the small factory of Daniel Peter, which is only a few steps from the railroad station of Vevy, the Orient Express passes, which will serve to reach France and the Orient. Soon the milk chocolate is found around the world. Being the sole owner of the process, Daniel Peter created in 1896 La Societe de Chocolats au Lait Peter. The same year, he confied in his memoirs that all manufacturers of Swiss chocolate have tried in vain to copy him, finding in it a proof of the value of his creation. As time passes, the Peter company merged with he giants “of the black square.” In 1929 the society born of these associations will be called Nestle-Petr-Cailler-Kohler, the ancestor of the present giant Nestle. Dying at the age of 84 in 1919, Daniel Peter was not able to enjoy his world success of his invention. In 1986, the fabrication of “Gala Peter” goes on still on the basic formula, so they explain at Nestle in Vevey. I love milk chocolate but never thought who invent this in the world. Today I knew Daniel Peter was the Inventor of Milk Chocolate and I will be always thankful to him. Specially me and other million of people always like milk chocolate better than any other chocolate. Thanks for sharing! As a little girl some 45 years ago, our family enjoyed a bittersweet Gala Peter chocolate. I don’t know where my parents (who had immigrated from Europe) found it, but I well remember its wonderful, unique flavor. Does anyone know if it even exists today? Peter’s Chocolate does still exist. 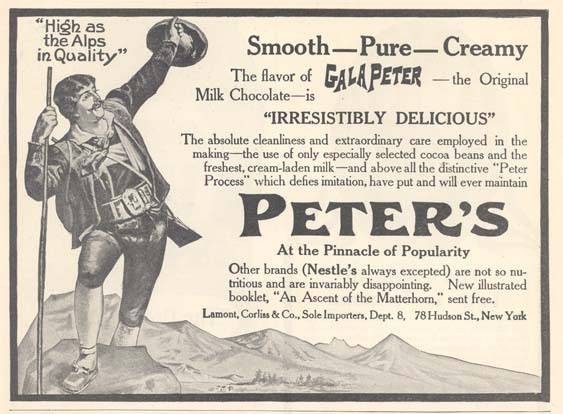 My family has been using Peter’s Chocolate for our confectioneries since the early 1900s. https://peterschocolate.com/products/ Peter’s Chocolate is currently owned by Cargill. The cacao tree was/is considered a sacred tree to Native Americans of Mexico and South America. A bitter and spicy drink commonly used as a febrifuge (medicine to reduce fever), taken hot by the Maya and cold by the Mexica was made from it. Prepared according to various recipes but often sweetened with sugar, chocolate became a luxury good throughout much of Europe by the seventeenth century, taken either as a stimulant and alleged aphrodisiac or with alcohol, in coffee houses and elite chocolate-houses. The Nahuatl word chocolatl means “bitter water”. The Spanish changed the word chocolatl to chocolate, just as they changed cacahuatl to cacao . Cacao trees are not indigenous to the Caribbean, The trees were brought to Jamaica from the American mainland by the Spanish and planted by slaves. Jamaicans made their own hot beverage, brewing it from shavings of freshly harvested cacao, boiled with milk and cinnamon called Chawklit Tea. Denis Papin, experimental technician at the Royal Society (England), boiled chocolate with milk in vacuo (vacuum) to preserve its goodness, while the physician Henry Stubbe published The Indian Nectar (1662), which detailed recipes involving eggs, sugar, and milk to prepare chocolate as a stomachic elixir. In England we are not content with the plain Spanish way of mixing Chocolata with water,” Stubbe explained; “[we] either use milk alone or half milk and half conduit-water. In 1672 Sir Hans was traveling in Jamaica. There he recognized the therapeutic qualities of chocolate. He saw malnourished, sickly babies revive after being given a mixture of cocoa, spices, and water. He also recognized that adding milk would add complimentary nutrition and make it taste better. When he returned to England in 1689, Sloane brought the milk and cocoa mixture with him. Back home, at last, he tried adding milk to the cocoa mixture. Eventually, he succeeded. and for many years it was sold as medicine. In 1820 the Cadbury brothers owned Sir Hans Sloane’s recipe. They used it to create their version of drinking chocolate. In 1847, in an attempt to combat the flood of chocolate that was entering the UK from the Continent (mainly from Switzerland and France), Fry and Son started to make tablets of roasted and ground beans, mixed with sugar. These were sold as eating chocolate. By 1849 Cadbury was selling “French” eating chocolate and as this new market expanded so the original enthusiasm for drinking chocolate diminished. What are you really eating in Milk Chocolate? Hope you enjoyed these other chocolate facts.